Call us to find out more and get started or visit the Phytobac® website for more details. Phytobac® is a safe, sustainable way to dispose of crop protection residues from your sprayer so they don’t contaminate water courses or drains. 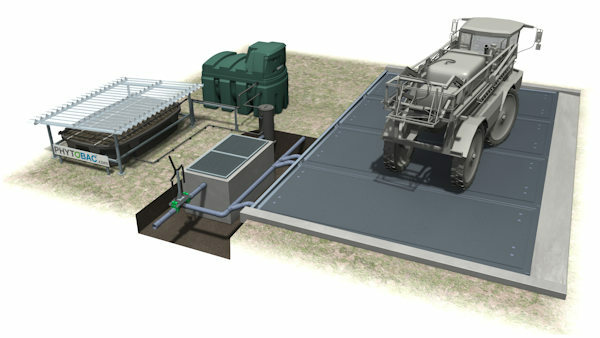 The modular system is customised for each farm providing an automatic, closed solution with no waste. Residual liquid and wash water from the sprayer is pumped at a controlled rate, via a buffer tank, onto a natural bed of straw and top soil in a liquid-tight container. The chemical products are degraded by micro-organisms in the soil and the water is evaporated. Any run-off from the bed flows back into the buffer tank providing a completely closed system. 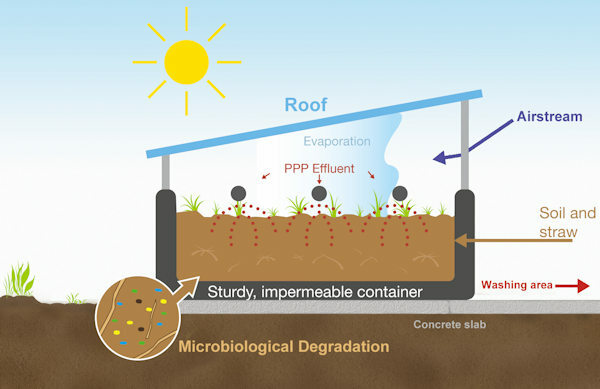 A Bio-Bed - a liquid-tight container with a roof frame, roof panels, inspection tube and pre-mounted drain-and-drip pipe. A Buffer Tank - a double-walled tank with pump, valves and a lockable housing for the control unit. A Control Unit with Sensor – which automatically monitors and optimises the moisture level in the bio-bed by regulating the flow. Why do I need Phytobac® ? A dedicated wash down area with a Phytobac system makes routine cleaning of equipment quicker and easier as well as reducing the risk of financial penalties or accidental contamination. Phytobac® is developed by Bayer CropScience and Beutech Agro with over 3,500 installations world wide. You get a fully controlled, closed installation based on expert advice and years of experience, no hassle and peace of mind. Visit the Phytobac® website or call us to find out more and get started.